Sachin Tendulkar's streak of low scores might have raised a question mark over his future but senior BCCI official and IPL chairman Rajeev Shukla on Monday came out in support of the senior batsman saying one needs to look at his "colossal record" before making any comment. "He will hang up his boots when he thinks it's time for him to go. He does not need any advise on this. Before making a comment on his performance you have to see his colossal record and his past performance," Shukla told reporters outside the Parliament adding that the veteran cricketer will come back strongly in the forthcoming matches. "He will do well in forthcoming matches," Shukla said. Tendulkar has been battling poor form for sometime and his last 10 innings have yielded just 153 runs at an average of 15.3, the lowest by an Indian top-order batsman in the corresponding period. The 39-year-old's last three figure score in Tests came in January last year against South Africa. 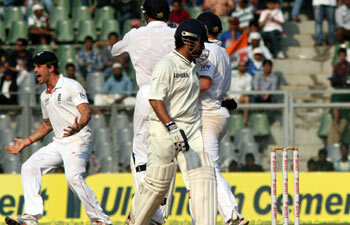 Asked about India's loss to England in the second Test at Mumbai today, Shukla said: "It is sad. After the victory in Ahmedabad the batting line-up could not perform the way it should have. It was a turning wicket and English spinners performed better." Shukla, though, said the board will look into the matter and would take necessary corrective measures. "We will discuss the shortcomings and so will the team management to see how the performance can be improved," he said. On the selection of the team for the next two Tests against England, Shukla said it remains the prerogative of the Selection Committee and nobody should interfere in their domain. "Selectors are also former players and they will take a call on this. Whom to select and whom not to, it is their domain," he added.